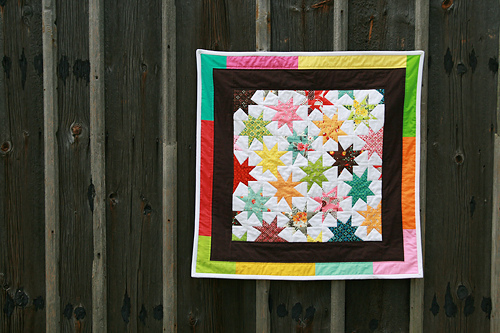 Today is our first Mini Quilt Monday and I am excited to share my first wonky star quilt. I'm not sure what took me so long to make these, they really came together quickly! I followed this tutorial on The Silly BooDilly. 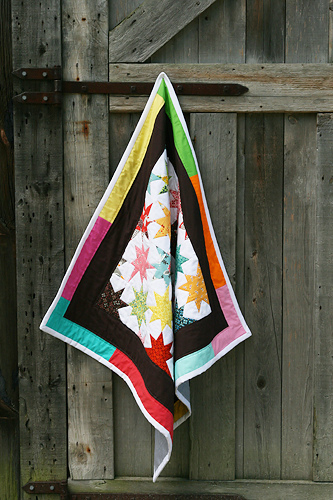 On this quilt, each section/square of the star is 3" unfinished. 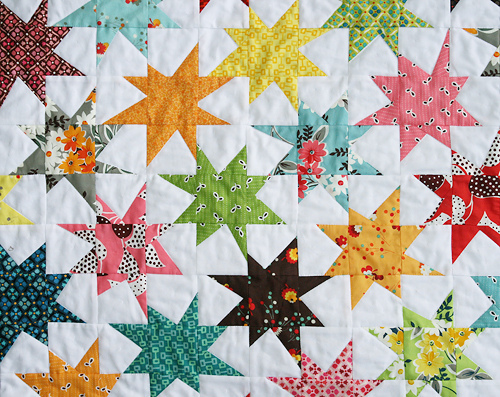 I laid out my stars the same way as a plus quilt, starting in the middle and working my way out to the edges. I don't have much of Denyse Schmidt's Flea Market Fancy, but I decided to go ahead and cut into some of my small stash. I'm really happy I did. Fabric is made to be used and enjoyed. I love the bright colors of this line, and am excited that Free Spirit will be rereleasing some of the prints this winter. Initially I planned to use the solid color fabric for a scrappy binding. But once I had it laid out around the quilt, I thought it would really add a nice frame to the the quilt as an additional border. I also tried something new with the quilting of this mini. 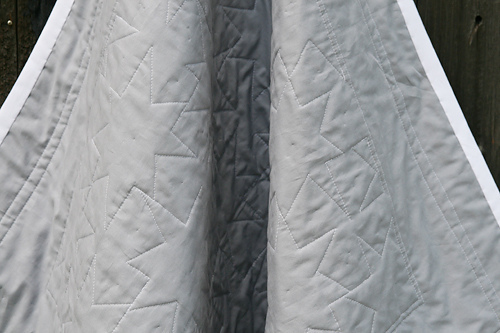 I quilted around each star using my walking foot. I like the finished effect...but it was a lot of quilt turning. I definitely wouldn't do it on something larger than this. It seemed like it took forever and honestly I didn't really enjoy it. This quilt measures 36" x 36" and is listed in the shop. 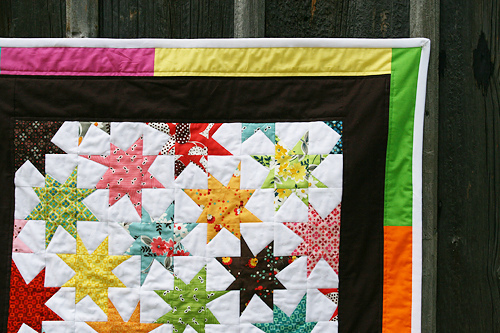 Besides the quilt, did you notice I updated my blog header? Also trying something new there. If you are reading this through Google Reader, come on over and check it out. So let's see what you've created this week! Link 'em up and grab a badge! Don't forget, it can be a work in progress. Just something new you are trying to challenge yourself!